From the Baldwin County Courthouse, go west on Hancock Street for 2 blocks or 0.2 mile (or the one large block containing Georgia College & State Univ.). Turn right on Clarke Street. Go one large block or 0.2 mile. Turn left onto Highway 22 west (Montgomery St.). Go west for 7.8 miles on Highway 22. Turn right on Lawrence Rd. Go 1/2 mile. Cemetery is on the right but cannot be seen from road. There is no path. Go through growth of small pines about 150'. 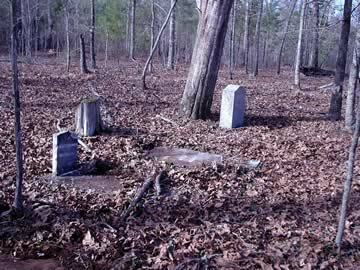 There are 5 graves near two big dead cedars and several cedar stumps. Grave and marker no longer visible in 1991.
and d. Dec 28, 1846.